Download Guidelines in PDF format. What is the basic purpose of the Area? How well are we fulfilling that purpose? The SFVASCNA meets monthly to discuss matters and administer those services that particularly relate to our relationship to the public such as PI & Phonelines. For the addict unable to get to meetings we have H&I. Activities provide a clean and safe environment for picnics, dances, and other opportunities to socialize. Our area by a decision of the ASC organizes and puts on an annual Convention. We also produce and distribute a Newsletter. Possibly the most important function we provide is the purchasing and distribution of NA Literature. These are all tasks that if taken on at the group level would likely cause chaos and impinge on a groups 5th Tradition responsibility. 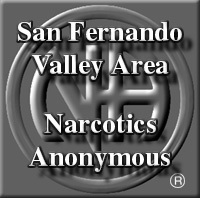 It is the gathering of the GSRs & the ASC, which deliberates and enacts resolutions concerning service matters brought before it in keeping with the 12 Traditions and 12 Concepts of Narcotics Anonymous Service. The area acts at the direction of the groups. Groups often will as the result of the concerns of its members, bring those concerns before the body for clarification or resolution. A particular group has asked that the ASC under take an inventory which hopefully would clarify where the area was performing well, where it was falling short. That we might acknowledge where we are doing well and what appropriate actions we might take to address our shortcomings. We have gotten an inventory form from the WSO, it has a history of being useful, is easy to fill out, is thorough, and easy to interpret. However we only get results if we participate, as in our lives and our recovery it only works if you work it! Please look over the Area Planning Tool form that is attached, make copies, download from our website, circulate it at meetings and gatherings, discuss with your groups, discuss with your sponsors and sponsees. Download the introduction and form together in PDF format. Download the form only in PDF format.